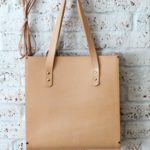 Large leather bag with smooth finish and wooden accessories. Inside equipped with practical cell phone pocket. Wooden parts are made from hard wood and safely riveted to leather. Purse is impregnated. New bag is impregnated so it is safe to water. For more information read the enclosed leaflet.